Our menu is ever-changing with the availability of seasonal produce. We invite you to check back often for the latest offerings. Choose any 3 of our lunch-sized tapas, salads or sides marked with an asterisk (*) for just $30 per person. Care for a drink? Add any soda or juice for an additional $4 or a tap beer or glass of our house red or white wine for $9. Available Wednesday through Friday from 12 - 2.30pm (excluding holidays). 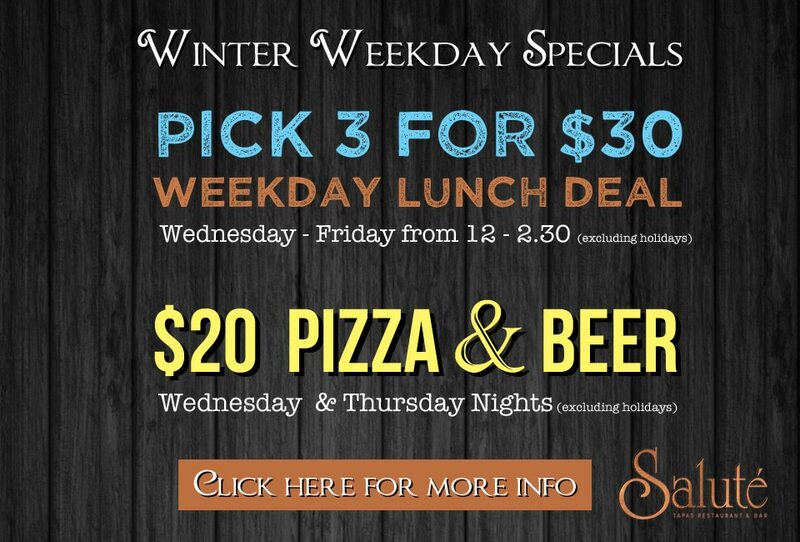 Enjoy a Margherita or featured pizza PLUS a glass of Parrotdog craft beer for only $20. Not a beer enthusiast? Not a problem! Simply choose a glass of our house red or white wine instead. Whichever you choose, we know you’re going to love it. Available Wednesday and Thursday nights (excluding holidays). These delightful shared plates are quick to prepare and designed to share amongst friends, making for a fun, relaxed and social dining experience. We suggest ordering a few items at a time which will arrive from the kitchen as they are ready. You can even create your own main course by ordering multiple tapas together to suit your own personal taste. Either way the choice is yours. Pulled Pork & Emmental "Croque Monsieur"
Our fresh & seasonal salads make the perfect compliment to your meal. We make "eat your veggies" a good thing. Our sumptuous gourmet pizzas are made to order with dough made fresh daily in our kitchen. For those sensitive to gluten and dairy, we also offer house-made gluten-free crusts and vegan cheese for an additional charge. For our younger diners, we offer several kid-friendly options that are sure to please. All meals include a main course from the choices below plus juice, vanilla bean ice cream in a cone or dairy-free sorbet & colouring sheet. Ages 12 and under, please. Two cheeses served with brewers barley crackers (gf option), herbed nuts (gf/v) and both our house-made fig "salami" (gf/v/df) and quince paste (gf/v/df). Proudly serving Havana coffee and t-leaf organic teas. Please ask for full selection and prices. Let us help celebrate those special occasions in life: birthdays, anniversaries, graduations... you name it. For such occasions, we offer a beautiful and luxurious chocolate cake that is gluten-free and served with freshly whipped cream and a blackberry-Merlot compote. Three sizes are available to suit your party's needs. Please call at least 24 hours in advance if choosing this option.For those who wish to bring their own dessert, please be advised a service charge of $4.5 per person will apply. This includes cutting and plating your dessert and serving it with freshly whipped cream and blackberry-Merlot compote. Saluté is pleased to offer a variety of gluten-free (gf) options but we are not a gluten-free restaurant. If you are Celiac or highly sensitive, please let us know so we can do our best to accommodate, but we cannot guarantee cross-contamination will not occur. Thanks for your understanding.